Yes, we’re serious! McCann is growing and we would love your support! 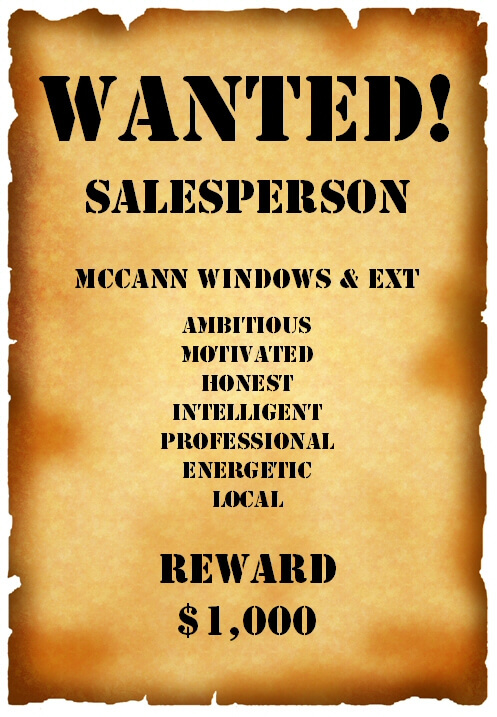 We are looking for an addition to our sales family and we are offering a $1,000 reward for the right person. We appreciate your recommendations. Please call, e-mail or even snail mail. Have fun and make money working for a straight-shooting, 21-year-old, family owned North Shore exterior remodeler with a great reputation. Sell into our existing lead flow and generate your own opportunities in our cooperative team environment. Must have at least 2 years of remodeling sales success, a nice vehicle, great communication skills, and a college degree. Compensation includes commissions, bonuses, expense allowances, health insurance, and 401K. A good sense of humor and a “can do” attitude are imperative.